Many bird species will return to the same nesting area year after year, giving you a pleasant view of birds flying in your yard every spring and early summer. 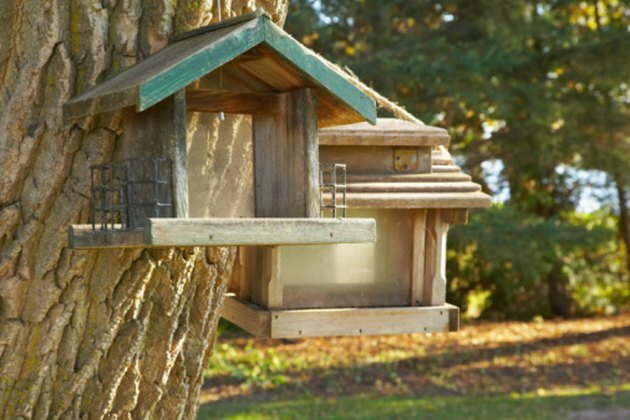 If you'd like to hang a birdhouse on your tree to give these birds a home, take care that your hanging method doesn't restrict your tree's growth or damage the wood in any way. If you place some sort of buffer material between your birdhouse and the tree, then your hanging method won't do any permanent damage. Take care when attaching a birdhouse to your tree. Slip a nail through a washer that is at least 1/2 inch across. Hold the washer near the head of the nail. Slip a small spring onto the nail above the washer. Hammer the nail into the tree trunk at the appropriate height for your breed of bird. Stop hammering when the spring begins to touch the tree. Hang your birdhouse at the end of the nail. The tree will grow outward, compressing the spring onto the washer, but it won't damage the growing trunk. 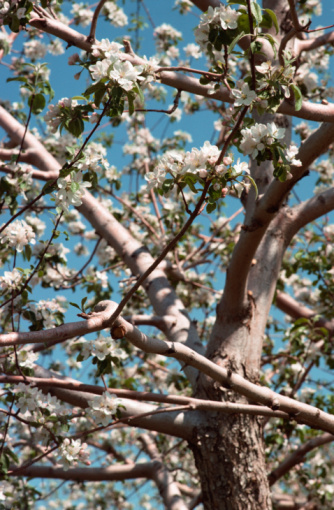 Choose a sturdy branch from which to hang your birdhouse. The branch should be one that comes directly from the trunk for the greatest stability. Cut an 8-inch piece of old hose, aquarium tubing or other plastic tubing. Make sure that the tubing is long enough to wrap completely around the branch with an inch or two to spare. Slip a 12-inch piece of wire into the tubing. Center the tubing on the wire so that an equal amount of wire sticks out of either side of the tube. Wrap the tube-covered wire around the branch and twist the ends to make a loop. Hang your birdhouse from the end of the loop. The branch will grow but the tubing will prevent the wire from cutting into the bark. Working in sunny Florida, Anne Baley has been writing professionally since 2009. Her home and lifestyle articles have been seen on Coldwell Banker and Gardening Know How. Baley has published a series of books teaching how to live a frugal life with style and panache.